The UK's request to delay Brexit drew more fire from business leaders, as the value of sterling fell on concern that leaving without a deal was more likely. The British Chambers of Commerce (BCC) said it was "unacceptable" business was no clearer about the terms on which Britain would exit the EU. It follows Prime Minister Theresa May's request to shift Brexit until 30 June. That spooked currency traders and the pound, which has risen recently, fell about 1% against the euro and dollar. Dr Adam Marshall, director general of the BCC said people and businesses are "tired and frustrated after three years of constant Brexit drama". Livelihoods and communities are "on the block", he said, adding: "The question on the minds of everyone in business in the UK is: now what? Our future is no clearer today than it was weeks, even months ago. And that is unacceptable." With no consensus in the UK's parliament over how to leave the EU, Mrs May felt she had no option but to seek an extension from Brussels beyond the scheduled departure date of 29 March. 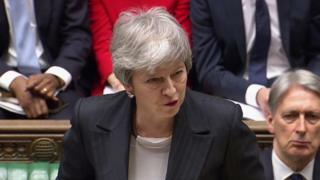 The delay requested is shorter than some in the financial markets had been expecting, a concern compounded when the Prime Minister warned on Wednesday that a no-deal Brexit was still possible. France then threatened to reject Mrs May's request unless she can guarantee to get her twice-rejected departure plans through parliament. Despite continuing uncertainty over the last few weeks, sterling had strengthened as financial markets largely priced out the chances of Britain leaving without a deal. But on Wednesday the pound dropped to as low as $1.3147, having rallied to a nine-month high of nearly $1.34 last week. The pound's fall was despite the dollar weakening against other currencies after the US Federal Reserve said on Wednesday that there was unlikely to be interest rate rises for the rest of 2019. Against the euro, sterling fell 1% to 86.39p, the lowest since 12 March. UK government bond yields also fell, with the 30-year gilt yield hitting its lowest since September 2017 after Mr May spoke to parliament.